Subject: [Roger's Reviews] Alea Iacta Est! - Caesar, Act II, scene ii, from Shakespeare's play. Julius Caesar is Columbia's latest entry in the block game genre and the second in their "Shakespeare Series". 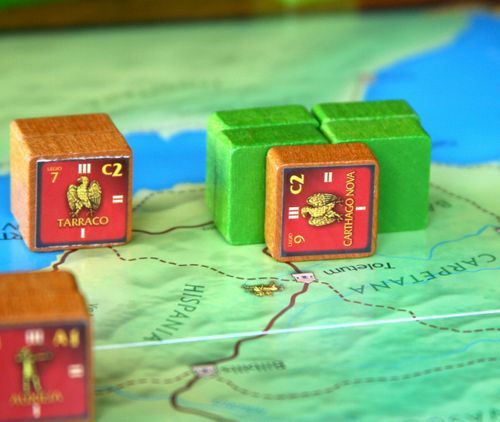 This game covers the five year Roman civil war from 49-45BCE. 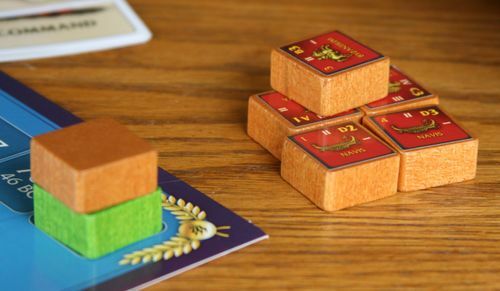 This is a two player game co-designed by Grant Dalgleish and Justin Thompson. It's advertised as taking 1-3 hours to play, but a typical game will run 90-120 minutes. 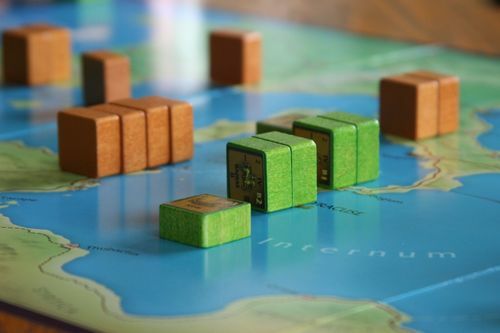 The game comes with blocks for both sides, green for Pompey, a single blue block for Cleopatra, and then a simply gorgeous bronze hue for Caesar. The paint on the blocks is also much more natural, more like a stain than paint, and the resulting effect on the board makes the game very aesthetically pleasing to me. The artistic interpretation of the Mediterranean basin on the 17x33" map is simple, clean, and easy on the eyes. The names of the cities are clear and easy to read from either side of the board, and the regional names are in a background grey font for interest's sake. The map is made of a heavy paper stock; while not quite as thick as GMT's "deluxe" maps, it very easily lies flat on the table. The 27 cards are standard playing card style with nice rounded corners and shuffle beautifully. The cards are a mix of command cards and event cards. More on the cards below. The game is about the Roman civil war with the forces of Caesar taking on the forces of Pompey. Caesar begins with his forces arrayed in Spain and northern Italy, while Pompey holds the southern side of the Mediterranean, southern Spain, and over in the east, Alexandria and Antioch. 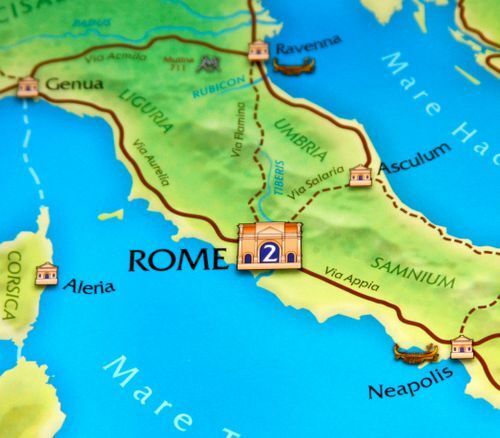 There are 11 victory cities in the game, two of which (Alexandria and Rome) are worth 2 victory points. The other cities are all worth 1. Killed leaders are also worth 1VP each. If any side has 10VP+ after the winter phase, they win instantly. Otherwise, at the end of the game, whoever has the most victory points wins. In case of a tie, the player holding Rome wins. 1. The play deck is shuffled, both players are dealt six cards, and each player chooses which five they want to keep in the current turn. The extra card is returned to the deck. 2. Both players select one of their cards to be played. There are two kinds of cards - command cards, which show a legion holding a standard with a Roman numeral (I-IV) and a number of medallions (1, 2, or 3), and event cards. If both players select event cards, then neither of them take effect and the next card turn takes place. If only one player uses an event, the event is resolved first. A group of blocks can split up and go to multiple destinations or stay together (or any combination thereof). Movement is 4 blocks along a major road, 2 blocks along a minor road. You can move your blocks up to two cities away, except when attacking, which is only against adjacent units. Navies (Latin: Navis) can move up to two sea zones from a port, or one sea zone to engage an enemy fleet. Land units can use fleets for amphibious movement (and retreat if necessary) also. Note for movement there is no stacking limit (you can have all your blocks in a single city, say), but there is a wintering limit at the end of the year. Whoever plays the highest value command card goes first and in the event of a tie, Caesar goes first. 3. Once movement is complete, any battles are resolved in the order selected by the starting player this turn. Blocks have a letter and rating (e.g. A2 means the unit fires with the "A" units, and hits on a 1 or 2) that tells both when they fire and how likely they are to be effective. The first round of combat must be fought, but after the first round is complete, units may withdraw. Here is where letter precedence takes key effect as "A" units get to withdraw or fire before "B" units, which go before "C" units, etc. Attackers must withdraw after three rounds of combat if any defenders remain. The card play sequence is repeated until all cards are played. Once the turn is over, wintering takes place. Wintering requires all fleets at sea to return to a friendly city, and each city can hold hold 3 blocks. Excess blocks are eliminated! Victory cities can hold either 1 or 2 extra blocks (e.g. Rome can hold 5 blocks, and Utica 4 blocks). Instant victory is checked for after wintering, and if nobody is the winner, the next year is played. At the end of the fifth and final year, final scoring takes place. 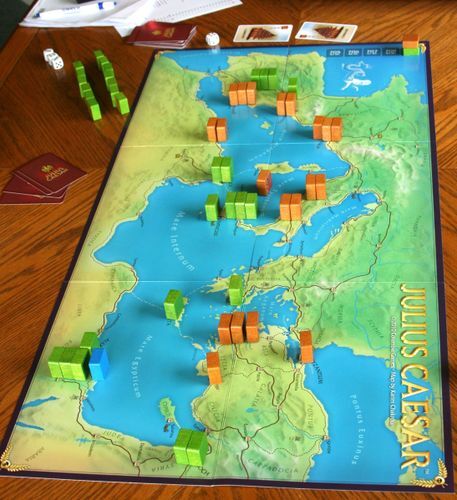 Julius Caesar is a dynamic game of manoeuvre, with quite a deal of cat and mouse interplay. 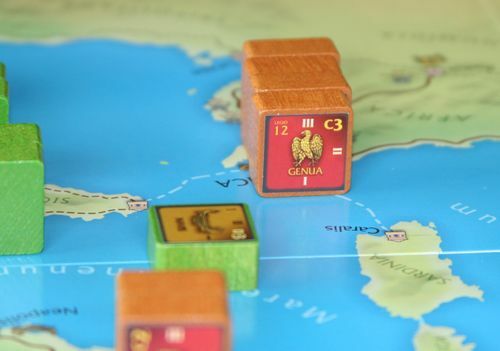 Pompey begins the game with 7VP held on the board (Carthago Nova, Tarraco, Utica, Alexandria (2), Syracuse and Antioch), while Caesar has only one (Massila). The onus is for Caesar to move fast and aggressively start taking victory cities. An obvious opening move is to take Rome of course, but then a tough decision needs to be made - southwest to Spain and then possibly by sea, or eastward to Byzantium. A lot of that decision depends on timing and holding the initiative. Then there is the card play. The key innovation in Julius Caesar is the combination of group movement (I-IV) and building (1-3 steps/blocks) in the same card. 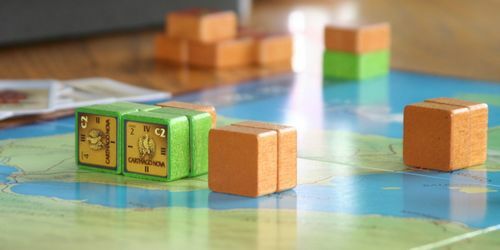 This idea is present in GMT's Hellenes, but you must choose how to split your action points between recruitment, moving, and building a step (or cadre). Here it has a much more dynamic effect because you move and then build. Certain units can only be recruited and built in specific cities, so it is incumbent on the player to go there to get that unit, and then make sure they keep them alive if the city isn't of long term strategic importance. The other important aspect of this game is the cat and mouse interplay. It begins in the card phase where you can take a chance on an event card, but if your opponent also plays one, then neither of you get any benefit from it. 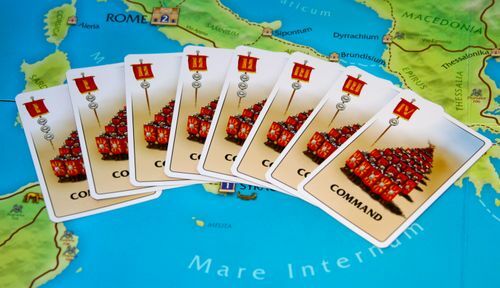 Similarly, as Caesar, since you win ties with command cards, you can usually assure that you'll go first, but perhaps you need to build up your forces for an assault and want to use lower ranked command cards as they have more medallions for building on them. As noted above, there are event cards in the deck that can confer a certain advantage to your side. The benefit of events is that they are resolved before command cards, but this advantage is offset by both the possibility of having it neutralized by your opponent also playing an event card (both are canceled), and that event cards do not allow you any recruitment/building. 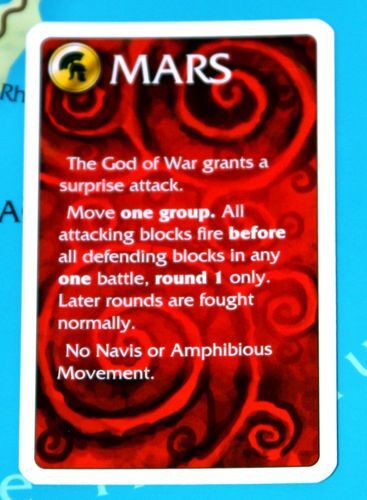 The Mars card is a perfect example of this dynamic in effect - as the attacker you get to go first, but then the defender will get to go twice as they respond to the first round of combat and then revert to going first in the second round of combat. There are only seven event cards in the deck, so odds are you won't get more than one or two in any given year's hand draw. None of the events is overpowering. They all give a single specific advantage, like the Mars card above. In a nice homage to the theme of the game, the event cards are all named after Roman gods. Command cards allow you to move then recruit/build. You can move yourself into a city adjacent to the enemy, or stay two away. If you're two away, you can't be attacked, but if you move yourself adjacent, perhaps your opponent thinks you're coming to get them and forces a response. Fleets add a wrinkle to the above because of the possibility of amphibious movement. Pompey cannot be casual about defending the Mare Tyrrhenum or Hispanum, because letting Caesar's fleets run free in there means they can bypass the troops defending Carthage and land in Iomnium to attack Utica, or worse send a strong force to try and capture Alexandria. Caesar's strategy is relatively more straightforward as they begin in a fairly centralized mass of units, but Pompey's is more subtle. With units being as distributed as they are and with the VP lead to lose, you'll begin in a somewhat more reactive mode, but you too need to control VP cities. One possible strategy is to move into the northeast where Athena, Byzantium and Epheseus are relatively close together and a relatively long way from Caesar's opening position, but that may mean sacrificing the cities and troops in Spain and risking a sea invasion that can take Utica and open access to Alexandria. One little sidebar note about the blue Cleopatra block. She begins the game in Alexandria on Pompey's side, but if that unit is ever killed in battle by Caesar, Cleopatra switches sides and becomes available for Caesar to build, so judicious use of this unit is advised. End game, with a narrow victory for Caesar. I've been playing block games in general, and Columbia's genre of block games in particular, for about a quarter of a century now and I've always been pleasantly struck by how what appears at first glance to be a similar game engine can yield such vastly different gaming experiences. 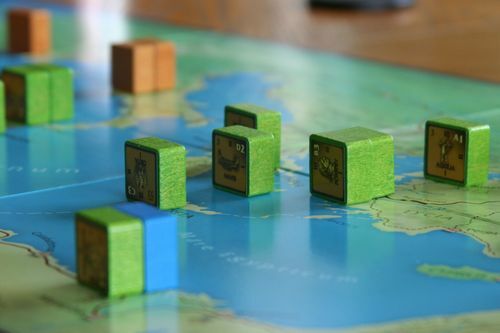 I've been watching the evolution of block games with interest as it's a category of wargame I particularly enjoy, and with Julius Caesar we are given another step in the evolution of this genre. 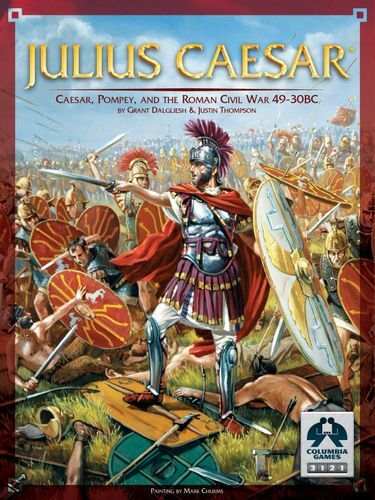 Although Julius Caesar clearly builds on the legacy of block games that have come before it, the game feels very fresh and innovative even to a veteran block gamer like myself. The move-then-build mechanic via the command cards is simply ingenious. Julius Caesar presents a lot of difficult choices to be made about how to deploy your units, whether or not to leave a block in a locale for future recruitment, and whether or not to leave a sacrificial block at a key fork in the path as a roadblock. Caesar has to push to get to cities where specific units can be recruited, and also decide how he's going to try to gain victory cities. Pompey has to keep Caesar off balance, jockey for position on the map to protect his assets, and then figure out how to get the last victory cities he needs. This game has a very brisk tempo. Each of the five years is subdivided into five turns represented by play of a card, making it a maximum of twenty five turns. Twenty five full turns in a game that usually averages ninety minutes. Wow. Finally, this game is extremely well balanced. Pompey's challenges are different from Caesar's, but with the way the command cards work, what will win you the game is executing your plan better than your opponent. As with any wargame, perhaps a lucky roll here and there will throw a wrench in the works, but the more skilled strategist will win. For the fans of Columbia Games, this game is slightly easier than Richard III: The Wars of the Roses and Hammer of the Scots in terms of rules complexity, but I feel it's more engaging in terms of strategy. For newcomers to the block genre, I would definitely recommend this game as not only an introduction to block games, but also as a game that will give you a lot of pleasant gaming experiences at the table as you explore the various strategies available to both sides; it's not obvious which one will be best, nor whether it will work the next time. Also, you really showed off the coloring on those blocks. A subtle touch, but one I can appreciate! First Class! That is what I call a complete review! Excellent! There were questions of balance raised about RIII, so it's good to hear you think this one in the series is well balanced. I own HotS and may own RIII one day if the imbalance myth is proven untrue. JC is the era of my interest and knowledge, and if the strategy is as compelling as you say, I may pick it up. But a few of the design choices (aesthetic, I admit, and I could fix them with a little DIY) really irk me. God events as opposed to political events. A Cleopatra block? She was in exile and Pompey was murdered by her brother, Ptolemy! They're enough to turn this Roman history fan off make this Roman history fan raise his eyebrow. One of these days I'm going to try a block game. One of these days. You really need to get on that! I own the game and have read the rules but have yet to play. It's been a long time since I've played HOTS but the sense I got is that HOTS is slightly more rules complex. Also, if you had to choose, would you choose HOTS or JC? Thanks for the review. But a few of the design choices (aesthetic, I admit, and I could fix them with a little DIY) really irk me. God events as opposed to political events. A Cleopatra block? She was in exile and Pompey was murdered by her brother, Ptolemy! They're enough to turn this Roman history fan off. I'm perhaps a little less put off by these things. The card "controversy" has me flummoxed quite honestly, but then what I care about is what the card does and not what it's called. Glad you liked the review. Cheers! OP: Nicely said. This was my first block game (see my session report); not sure how many more I'll buy but I think it's a worthy addition to my collection. It "feels right" from a complexity/theme/speed of play perspective. I've played a few games that are fun but start to feel like they're dragging (A House Divided, for example). JC has a better tempo. Great review. Time to add another game to my wishlist. Good review, I like the many pictures you took. Now I am sold, not that it took much pushing. Thanks for a superb review. Really looking forward to getting this on the table (as if I wasn't already!). You inspired me to read more Shakespeare, and perhaps try a new genre. I just played my first CG blockgame this weekend, well non-Eestfront blockgame anyways. I played Liberty and absolutely loved it, and from what I can tell most of these block games use pretty much the same system, which is fine with me as it makes for less rules memorization. I own Crusader Rex as well and I want to get it to the table soon. I think CG has done an outstanding job with the visual upgrades on their last two games in Richard III and Julius Caesar, they are both stunningly beautiful games IMO. It really is a fun and simple system that allows for quick gameturns and a lot of action. I will be picking this one up at some point I am sure. lower ranked command cards as they have more medallions for building on them. Clever. Does this mean that there aren't any always-bad cards. Either you get to move a lot or you get to build a lot. Superb review! After reading this review and Ender's review of Richard III, I am now convinced that I need to try a block war game. Which of these two would you suggest as the best starting point for someone who has not played this type of game before? Tough call. I like the period of Richard III better. I think that Julius Caesar is more fun. Julius Caesar is a full game. Richard III has two scenarios posted on Columbia's site to let you play a 7 turn game (instead of the full 21). 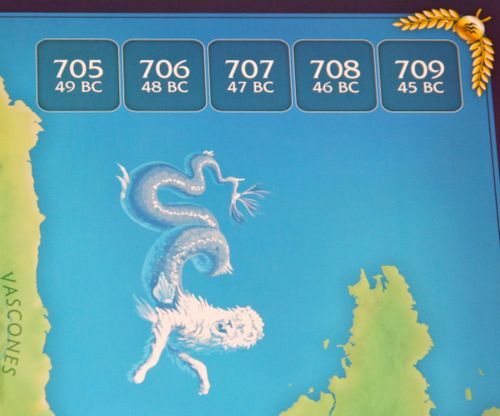 Given you like TS and Through the Ages, the rules certainly won't be a hindrance to you. I think if I were forced to choose only one, I'd pick Julius Caesar, but they're both good choices. If you were forced to choose between JC and HOTS, which way would you go? JC. HOTS is a fine game, but I find you need two equivalently skilled players. Honest and very damn true. I love winter attrition as much as the next block wargamer but it can be a little confusing in HOTS with all those fickle Scottish barons. I own and have played both Crusader Rex and Richard III, and even though they are both CG block games, they are completely different in terms of play experience. To people looking to try a block game, I would be very careful to exclude one CG for another or choose one above the other. Even though they all look somewhat similar, design wise, I think there are many differences between the games. To me at least, a CG is not a CG - that's like saying that hex-and-counter games are all the same - they all have their twists that make them unique. Where Crusader Rex really feels like a wargame, Richard III feels like a tricky cat and mouse game, where it is difficult to predict how things will look after the ongoing campaign. Both great, but completely different. I agree with this sentiment wholeheartedly! Twilight Struggle, 1960: The Making of the President and 1989: Dawn of Freedom all use a similar underlying card driven mechanic, but the game play is very different indeed. So it is with block games. Like I said in the review, I've always been pleasantly struck by how what appears at first glance to be a similar game engine can yield such vastly different gaming experiences. Thanks for the great review, I have been looking to get a couple of block games. After doing a little research, I decided to try Hammer of The Scots and then a second title. I am oscillating between Julius Ceaser and Crusader Rex. How do they compare in terms of gameplay? Thanks. Leroy, thanks for this nice review! What can you say about the replayability of the game? I've not played Crusader Rex, so I can't pass comment. Any block game with sieges (Crusader Rex, Texas Glory, Prussia's Defiant Stand) is naturally more complicated than games without siege warfare. Crusader Rex is a great game, but if you're unfamiliar with block games I'd try a few non-siege games first.